May 10, 2018: Triad RF Systems has released the TTRM1105, a compact and lightweight bi-directional amplifier that operates in the lower C-band from 5300 to 5900 MHz and offers up to 5 W of output power. The TTRM1105 also features new proprietary high speed Tx/Rx switching circuitry, as well as improved Rx noise figure, leading to higher data rates at longer link distances. This unit also has a wide voltage input range of 10 to 28 VDC making system integration less of a hassle. This class A GaAs module is designed for both military and commercial applications. It is capable of supporting any signal type and modulation format, including but not limited to 3-4G telecom, WLAN, OFDM, DVB, and CW/AM/FM. The latest device technologies and design methods are employed to offer high power density, efficiency, and linearity in a small, lightweight package. Features: Over / under / reverse voltage protection, Forward power measurement, Reflected power measurement, High speed Tx/Rx switching control, Temperature output, Optional heatsink, Manual or automatic Tx/Rx switching available. 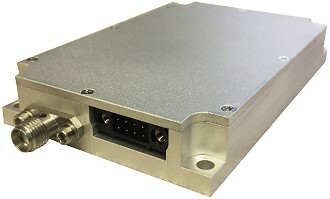 Triad RF Systems, founded in 2010, designs and manufactures high-performance, high-power RF and microwave amplifiers operating at frequencies from 10 MHz to 20 GHz. The company focuses on delivering extremely high reliability and ruggedness when integrating its products within the confines of subsystems and systems - without sacrificing efficiency or linearity and adhering to stringent requirements for size, weight, and power. The company's products are employed in commercial and military applications, including terrestrial wireless and satellite communications, radar, electronic warfare, medical, digital video broadcast, and avionics systems. Copyright © 2018 Triad RF Systems, All rights reserved.